Some of the crew of Passion posing with the perpetual trophy and the very nice one to keep. 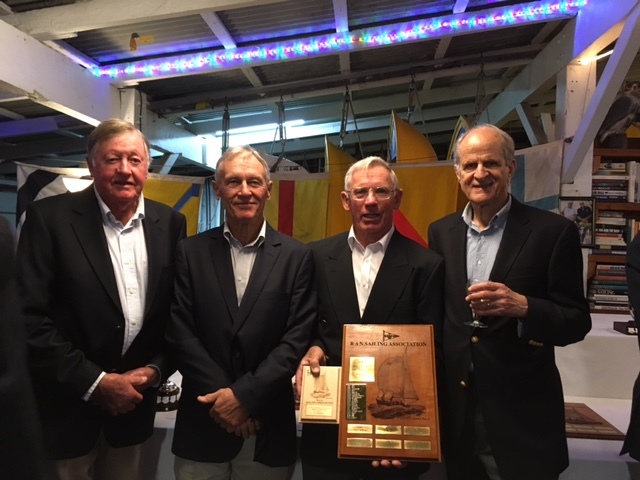 Some of the crew of Passion picked up the trophy for the first place in the 2016 RANSA Winter Wednesday series last night. It was an good series for Passion as we won the Division 1 by a large margin. What made it particularly pleasing was that RANSA had initially relegated us to Div 2 for the slower yachts but reinstated us in Div 1 on request. We wanted to keep sailing against our familiar competitors, the Northshore 38′s, Rainbow, Izzi and others and the same sentiment is on play this coming season with Passion X.
it was the second time we had won the series and for the third year in a row it was a Greenwich Flying Squadron yacht. Izzi had won for the past two years and as they had been improving over this time it was no reflection on the handicappers. From memory, because we cannot keep the perpetual trophy, Greenwich Flying Squadron yachts had won for four of the last six seasons and we will be trying to make that five out of seven this year. 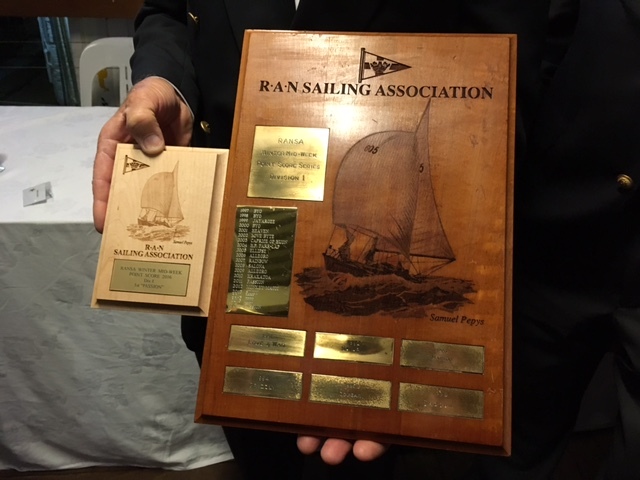 It is quite an honor to have the name of Passion engraved twice on the perpetual trophy alongside some of the legends of Sydney Harbour and we will try hard to add Passion X to the list. After taking the grand children for a sail on the harbour I realised that there is more good ideas on our Didi 40 Cr, Passion X, that I should write about. Cabin top hand hold and jack lines as well as conventional webbing deck level jack lines. Also a good view of the mainsheet bridle system and the narrow deck that needed the smaller diameter deck organizers. While the hull was level on land I was skeptical about the angle of the cockpit coamings. On the level the body seemed to slide outwards to the safety lines and it seemed difficult to get back into the cockpit. In practice the angle is excellent as the yacht heels a little more than our previous craft and with the heel angle the coamings are ideal. 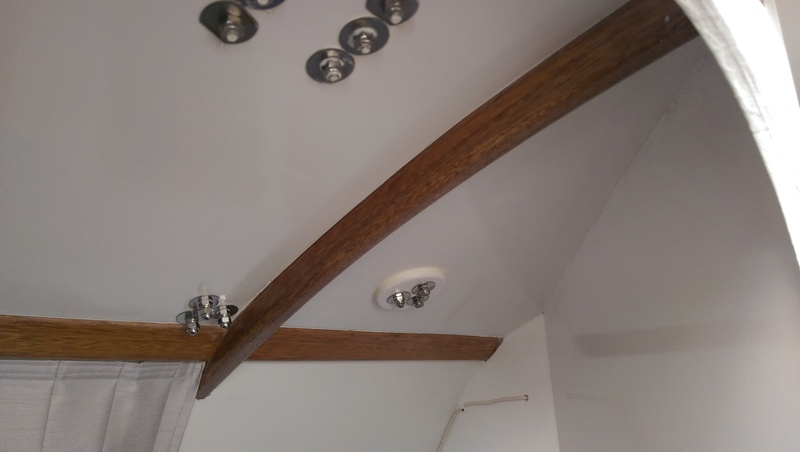 On the cabin top instead of timber handrails I have installed jacklines that double as hand holds. This is in addition to the traditional webbing jack lines that run from the stern to the bow and with a double harness the short line can be attached to the cabin top lines while the long tether is attached to the jack line on the deck. 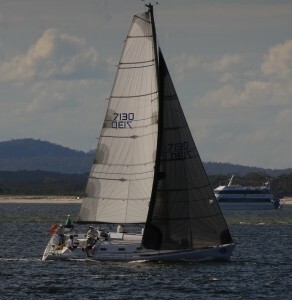 I gave the system a good try out on the trip back from Port Stephens in 35 knots and at all times I felt very secure. The shorter jack line on the cabin top does not deflect much and I felt particularly secure attached to this by the short tether. The lighting has worked out well, especially the option for red or white light and the different lighting levels available for both colours. On the mooring I left one of the cabin lights on red at low level as a night light and that was particularly practical. I have already forgotten that these were very expensive and now just enjoy the style and functionality. I did put lights inside the engine compartment and in the deck locker to save having to search for a torch any time I needed to look inside. These are LED lights and I tend to leave them on all the time for the convenience. The cushions too have worked out well and the idea of side cushions in the V berth that I copied from MOJO has been very practical. I went one step further and hinged the V berth tops so that I can fold up the berth tops for better access to the large storage area underneath. This did require a lot of extra carpentry as there is a narrow section of the berth top bonded to the hull and stiffened with for and aft stringers but result was well worth the extra effort both in terms of a solid reinforcement for the hull and for access to the storage area. Before I completed the engine compartment I did a trial alignment of the engine to ensure that All the mounts could be accessed. 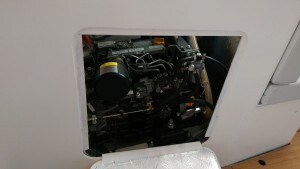 After much frustration I increased the size of the side access door to make the mounting bolts very easy to access and I appreciated this modification when doing the alignment. 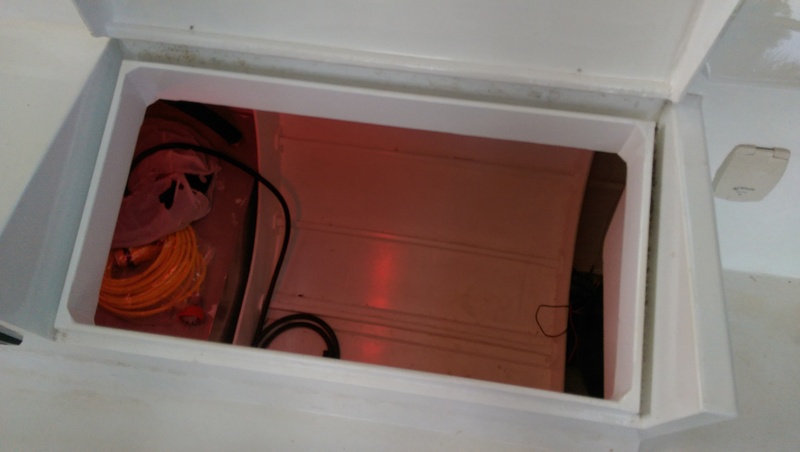 My electrician also suggested an access door to the solenoid in case the 12 volt cabling came loose and I did need to tighten the connection after or 14 hours of shaking in the ocean. I will modify this connection so that there is room on the stud for a nut and a nylock lock nut just to be sure. I am learning every day to appreciate the thought that Dudley put into the yacht design and the extra time and attention to detail that we put into the construction. 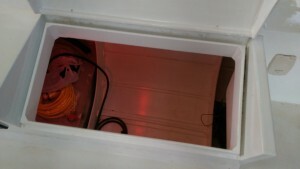 Red or white LED options in the deck locker. Dudley’s detail for the locker has been outstanding. Detail showing the fixed edges to the V berth tops so that the lids can be hinged to swing up. The red glow from the cabin lights on the red setting is easy on the eyes. I have still to master the variable light level on the instruments and wish the manufacturers has a light level sensor to adjust the levels automatically. After a very good test in 35 knots on the trip back from Port Stephens I have had the chance to reflect on some of the choices we made. The interior is remarkably dry. There are a few drips from deck fittings where a bit more Sikaflex is needed but these are very minor. All the holes are twice saturated with epoxy. By that I mean they were drilled, epoxy saturated and then drilled again and epoxy saturated so there is no timber exposed to swell to seal the leaks and it will have to be done with sealant. There is no perceptible leak from the engine shaft seal. It is an Italian seal with a spigot for adding lubricant and one for venting the seal so that air bubbles do no accumulate. 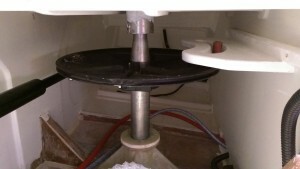 I thought that the bearing in the stern tube may need forced lubrication and bought the kit in case but the water has never sucked out of leaving the bearing dry so it is one item that will not be used. I did shift the bearing from the top of the stern tube to the bottom to give a longer distance between the gearbox coupling and the bearing. The position at the top of the stern tube was at the end of the recommended range and the alignment of the tube was good enough to give me the option to move it to the bottom of the tube. In hindsight the Volvo seal would have done the job and I now have one in stock as a spare. The autopilot is a wonderful luxury especially on the long delivery trips. The manufacture is definite of the need for stops to prevent the linear actuator arm turning the rudder more than plus or minus 35 degrees and to that end I have a 24 mm thick plywood beam with a semi circular hole in which the rudder stop travels. It looks very solid and may be over kill but it does stiffen the last frame before the transom. I don’t know when these stops will come into play as I have not seen the autopilot turn the tiller more than a few degrees. I was concerned that on autopilot we would have to lift the tiller to stop it hitting the crew in the legs but on current performance we can just leave it moving around the few degrees and not bothering any of the crew. On Passion , our beloved jeanneau SO37 we tried many traveller systems and ended up with a top of the range wide travel Harken system. Dudley’s standard is the cockpit mounted traveller and I did install the timber beam under the cockpit in case it was needed. 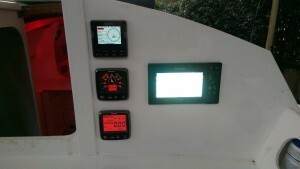 Dudley approved our cabin mounted system because with the 40 ft Cr version the cabin is so long that the connection to the boom is well past half way. The boom was specified for our deck top attachment location. In practice it has been very manageable. It is an idea stolen from the Jeanneau SO349 which while shorter is not too different. To ensure the loads are well distributed we have a very large area of additional 12 mm plywood under the cabin top. 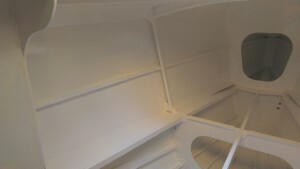 The doubler goes from the bulkhead at the end of the cabin forward all the way to the front of the head and quarter berth ante room and serves to lock in the fore and aft bulkheads on either side of the companionway. Where the mainsheet bridle is attached there is an additional 12 mm backing plate bringing the bearing surface for the three 10 mm bolts on each side up to 36 mm. Our very conservative rigger gave it his approval and I will be interested to see how it goes over the years ahead. I have also added doublers from the chain plate frames forwards to the mast support bulkhead. It is a small area but it does lock in the chainplate frames. 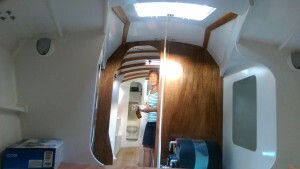 In front of the mast bulkhead the cabin top is also made up of 24 mm of laminated plywood so that I could do away with the framing. 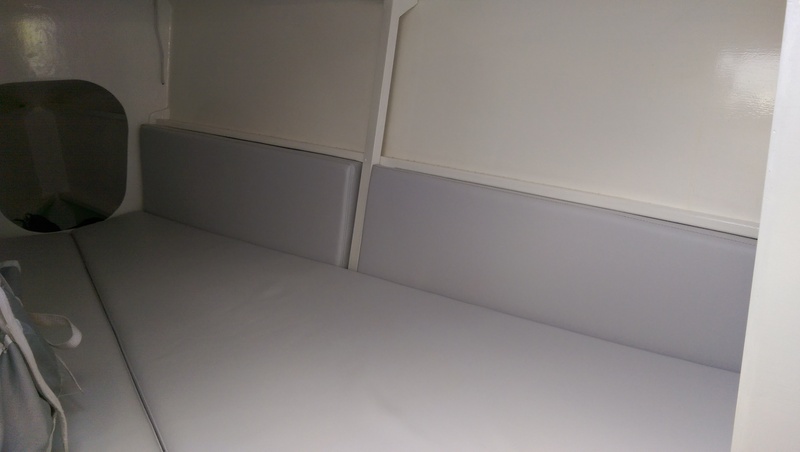 It give a very nice clean look to the roof of the V berth and is immensely strong. Because it is such a narrow cabin top the additional weight is negligible. The narrow cabin top limited our selection of deck organizers so we selected the Spinlock 35 mm range. We have a lot of bearing area for the bolts with the 24 mm thick plywood roof so had no worries there. In practice the plastic sheaves could not take the very high loads of the reefing system so we have replaced all the high load sheaves with the alloy variety Spinlock have as an option. Today I purchased enough alloy sheaves to replace all of them for long term peace of mind. The alloy sheaves have stood up to hours of 35 knots wind with the reefing system at full load so it has had a good test. 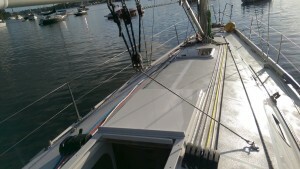 I am very pleased with my three single line reefing system on the Allyacht Spars boom. Two of the lines have the internal pulley system and the third line goes from the boom exit down to a block at the base of the mast back up to the pulley on the third reef and all the way back to the base of the mast. The line is held against the mast at the reef point by a large twisted shackle that conveniently fits into the goosekneck fitting. I have the same system on Passion and it worked very well so we ordered it for the new rig on Passion X. Not many yacht would have three single line reefing systems and we put this one to the test on the way home from Port Stephens in the 35 knot conditions. 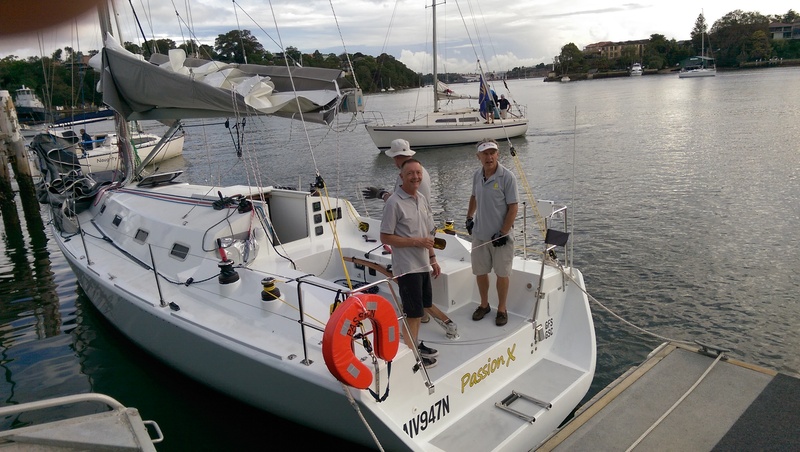 The only time we tried it on Passion was in a practice run out through the heads in similar 35 knots conditions but this time on Passion X it was for real. There is lots more that I am really please about and I will try to remember to take photos for the blog. It has been a big two weeks since the last post. What was going to be a leisurely trip to Newcastle via Refuge Bay turned into a one day dash. The next day was the first ocean race for Passion X, a friendly dash from Newcastle to Port Stephens. With fresh crew joining us for the dash we made a good start and hung in for the first hour. The course was a tight reach and with winds occasionally gusting to 25 knots we put in a reef and were still overpowered. On reflection we might have sailed faster or at least as fast with a second reef and the No 3 jib. We did break one shackle on the mainsheet system which was not of much consequence but it afterwards the one First 40.7 in the fleet did climb over the top and stay in front. We had been catching Mortgage Choice Rumba slowly until the shackle broke but they managed to hang on to beat us even though we hit 15 knots down a wave after the bear away to the shortened course finish which was placed well above the course route and hard to see. 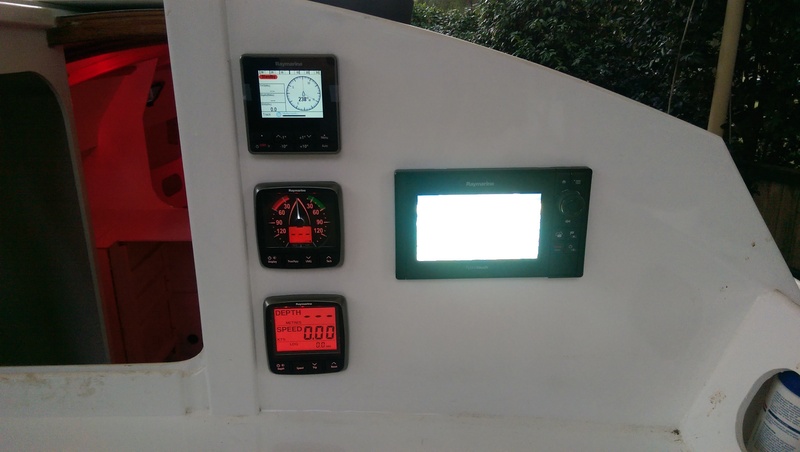 We did not learn a lot from the beam reach dash other than that we were not sailing to the ORCi rating for the yacht and had room for improvement. There was no rest for the crew as the following day was the first of the three Commodore Cup races. 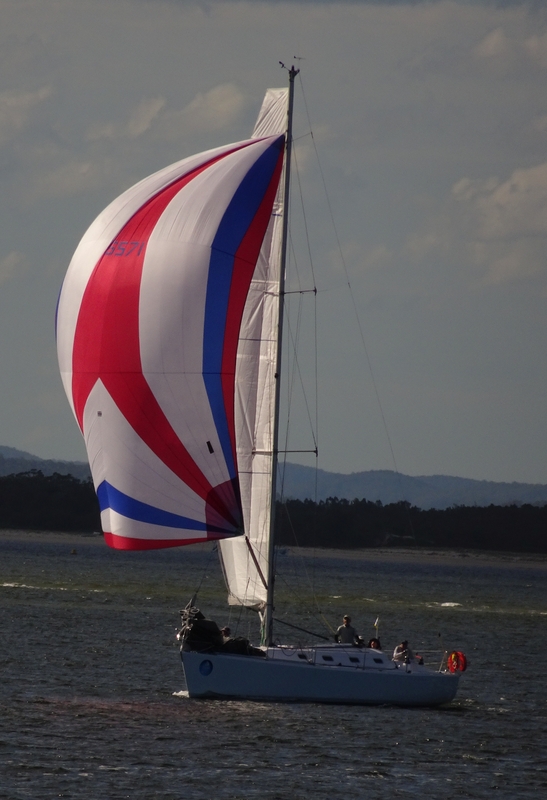 The Commodores Cup was conducted inshore in strong tidal conditions and relatively narrow waters between the sandbanks. 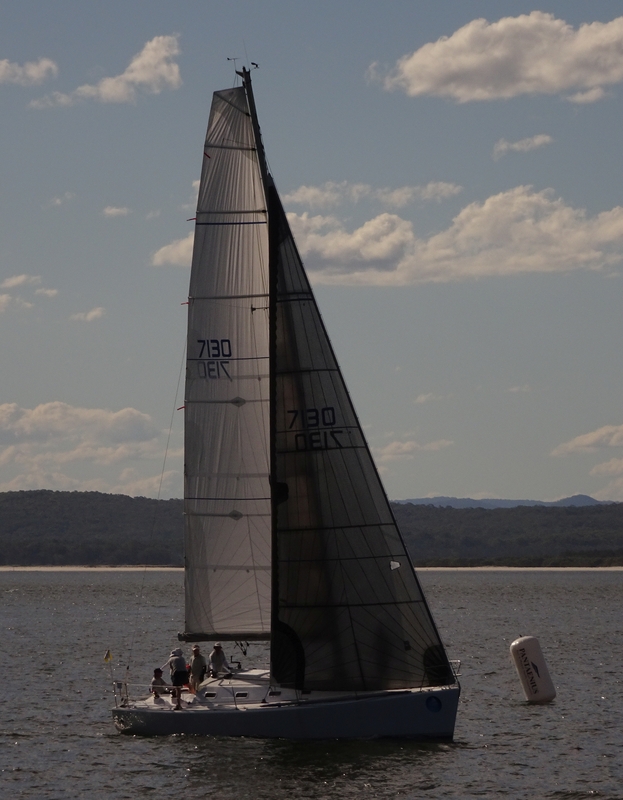 In the first race we had a few spinnaker issues but still managed to be just 4 minutes behind a Sydney 39 Cr, 2 minutes behind an X43 and one minute behind a Dehler 46. We finished half a minute in front of the First 40.7 and felt we had a lot of room for improvement in our spinnaker skills. Wednesday was Race 3. When a strong header came in we were caught with spinnaker up to leeward of the fleet and up against the sand bank so no where to sail away square. We lost the spinnaker up in the air and by the time we had it under control we were at the back of the fleet that started 5 minutes after us as they came down with the fresh breeze. We did much better for the rest of the race catching almost all the second fleet and some of our own. Much happier to windward even with the No 1 and full main in 15 knots. Face saver with the second last tack to the finish where we did beat the 40.7. I wonder what woes they had to be back with us? I enjoyed the lay day during which we had plenty of visitors who inspected Passion X and complimented us on our achievements. I had it finished enough inside to be presentable and very livable and perhaps only I can see what more had to be done. 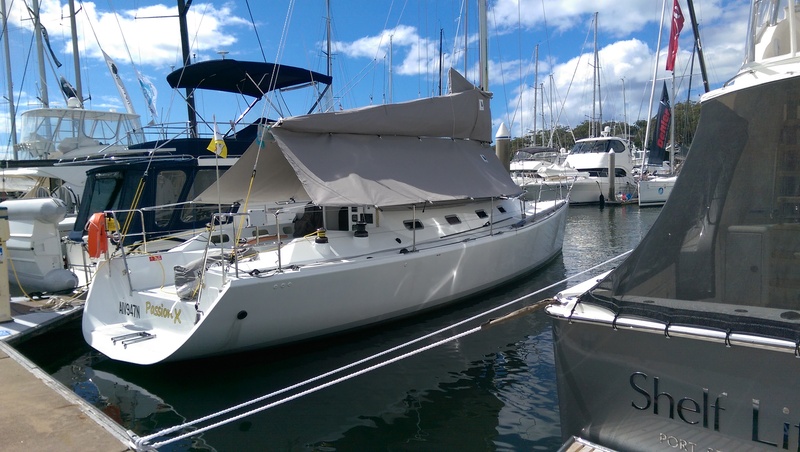 Elaine and I lived aboard for the regatta and found it every bit a livable as our beloved Jeanneau So37,Passion, which is now up for sale. in some areas the extra length makes it more livable as the extra metre of length is spread out over all the cabins. We did not miss the extra doors on Passion and the only improvements Elaine has ordered are a wall mirror in the V berth and a couple of towel hooks in the head. I for my part have a little behind the scenes finishing such as rounding the under edges of floor panels and several more coats of epoxy on the rounded edges. I am considering re routing the cold water lines so that all the ‘T’ joints are in very accessible locations and I will look for ‘T’ fittings that have enough length for two hose clamps per join. That said what I do have lasted a good pounding in rough seas and 35 knots. The first race of the Port Stephens Cup was off shore. 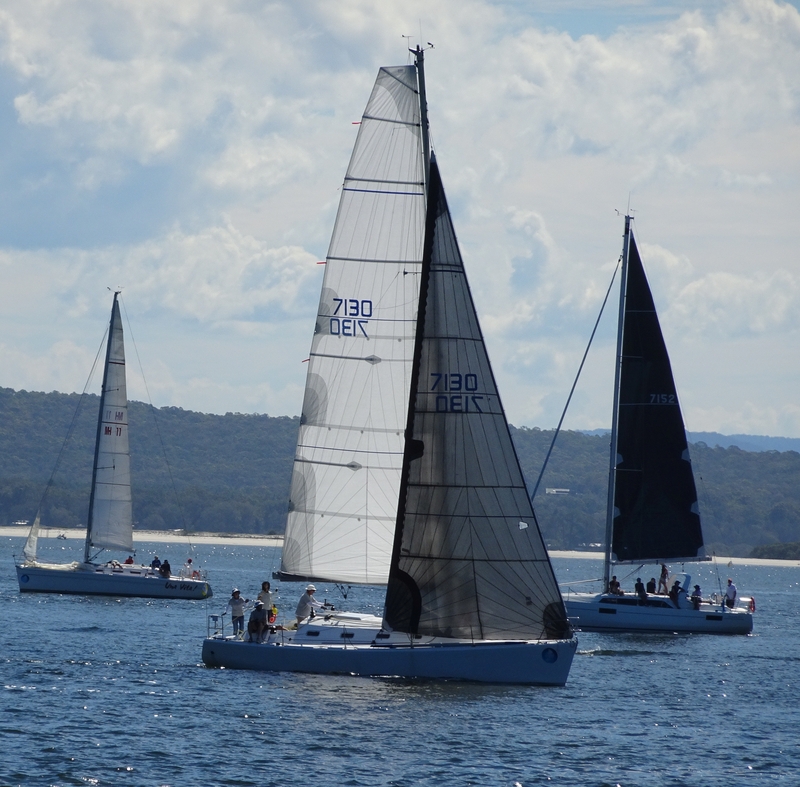 We started in a light northerly breeze and our Gosford club mate John Sprague in a modified Mont Gay 30 blitzed the fleet away from the line only to be first into the calm between the breeze and last out. We were a lot slower off the line but in the drifting conditions caught the leaders and were among the first into the new breeze. We hung on with the 45 footers for a lap but they drew away and on the run home built up a good lead. Rocksalt a Dehler 38 competition with mast head spinnakers took six minutes out of our time on the last run home but our early lead and with only ten finishers and a third on handicap our prospects looked good for a podium finish. Race 2 again showed our good upwind speeds against the Dehler 38 but their faster downwind performance as they took 4 minutes out of us on the last run home. Race 3 was inside and we gave up two minutes on the first of three windward works by being on the wrong side of the fleet. In the reduced fleet we looked lonely at the back except for the even more lonely J35, J Force, who were the shortest yacht in the division except for Devils Lair. The downwind legs were painful as the fleet inched away. The course was too confined for reaching across the downwind legs and despite our very credible hoists and drops we lost ground even to the best of the Division 2 yachts. Upwind for the next two legs we held our own and must have made up ground based on the finishing times. Our tenth place left us sixth overall but only four minutes in the last race out of the podium position for the series. Some race photos from the last race showed how small our fractional spinnakers are compared to the fleet. No one is racing on rating so they all go for the biggest kites that will fit on the boat. Our spinnaker was small on Passion and on Passion X it could be 25% bigger and not be extreme. We did put crew on the bow to lift the stern but we still needed crew in the cockpit to work the sheets. We did learn that beating with the strong tide can be confusing as the boat feels different. We did learn to be very careful to have the boat going flat our when feathering the prop as at zero knot it was possibly just sitting there unfeathered. We did learn that we cannot outpoint a good fleet. it might be ok back at the club but practice and the polar targets for the respective yacht shows our best angle is a couple of degrees lower. In the ocean we could see Passion X drawing ahead if lower than the Dehler 46. This is good if we are sailing into headers but not much help if the breeze is lifting. We do need to get moving on the bowsprit for Passion X. In several of the off shore races we held in well with the 145% genoa against asymmetric spinnakers but they had occasional bursts when the breeze freed that gained them a lot of time. I think the fractional asymmetric we have will be OK but we do need a mast head symmetric spinnaker to mix it with the Regatta fleet. The trip home was a desperate dash to beat the week of southerly winds forecast and the high winds forecast for today. We left at first light with two other yachts taking advantage of the westerly winds. 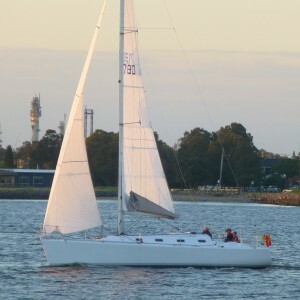 We started out with three reefs in the main and the No 3 jib but when the breeze built to 30 knots we took the jib down and lashed it to the deck sailing on with just the triple reefed main at 8 knots. One of our group headed for Newcastle but we were so far out that it would have taken us three hours to get to Newcastle and at our sailing angle towards Sydney we would be twice as far down the coast so down the coast we went. Closer to Sydney the seas were less lumpy and the breeze lighter so we rehoisted the No 3 and made 8 knots again. For the last two hours we were almost on the nose heading towards the heads. The breeze lightened enough for us to take out the third reef and sail on two reefs for the rest of the trip. Passion X handled the pounding well. The auto pilot did a remarkable job of steering for a good part of the trip and it was only in the tight angles going into the heads that we reverted to hand steering. Nothing broke in the 35 knots conditions and everything went up and down as needed. We did learn more lessons in the long slog home. We need a smaller jib for 25 knot conditions. A No 4 and two reefs would have been faster. Perhaps we could have hoisted the storm jib for the passage but it won’t cut it in club racing and we don’t club race in much more than 25 knots. Elaine and I are very happy with our Passion X and I will have a lot of fun optimizing what we have and learning the right sails for all conditions. Crossing the finish line in the last race four minutes off a regatta podium place.